A great gift for new parents, or the perfect addition to any nursery. Silver plated and lacquer coated for tarnish resistance. 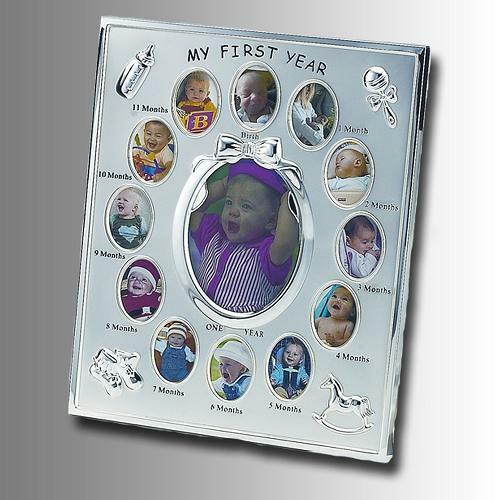 This album is extremely rich with a high quality satin silver finish. There are 13 openings, 12 smaller openings for birth through 11 months, and a center larger opening for a 1 year photo. The album has a high quality black velvet back cover. Individually boxed. Sizes listed are the photo size. Overall dimensions: 9" x 11" x .1.75". Each small opening is for a 1.5" x 2" photo, and the center opening is for a 3.5" x 5" photo. 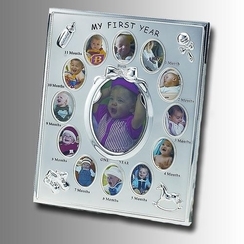 A small .375"x3" silver ornamental plate could be mounted centered under the oval cutout area with the baby's name and birth date(optional).